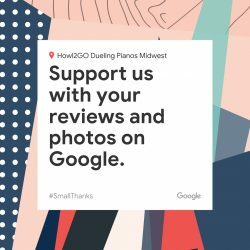 For Dueling Pianos, the “best in the Midwest” is Howl2GO. See our reviews, and then get in touch to book! We have used Howl2Go the last two years (2018 and 2019) as a fundraiser for our Foundation and Young Leader programming. The Howl2Go team members are very professional and committed to making our event a success. The performers are very adaptable to our location venue, timing, sponsor recognition, and audience. We have received rave reviews from attendees. Our fullest compliment and recommendation! Book them! You will not be disappointed!! From my first inquiry to the conclusion of the event, my experience with Howl2GO was professional and First Class! Our event had approximately 200 attendees and they all loved the entertainment. There were so many compliments, I lost count. I highly recommend Howl2GO and would not hesitate to call upon them for my next event. This was the second time we’d hired Howl2GO for an event and WOW were we impressed. These three artists, Terrell/Wesley/Per, were like a well oiled machine. They played perfectly off of one another and kept the crowd involved throughout our entire awards banquet. They were professional, attentive, and TALENTED. Thank you guys for making our East Tennessee CENTURY 21 Awards Banquet a night we’ll all remember!